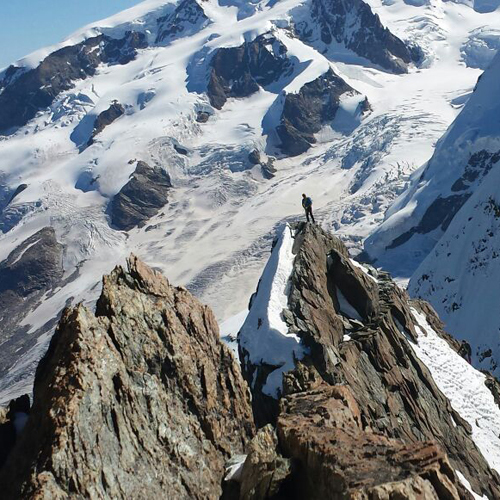 Here you’ll find some of what Monte Rosa can offer for the lovers of high places and leaving their traces. 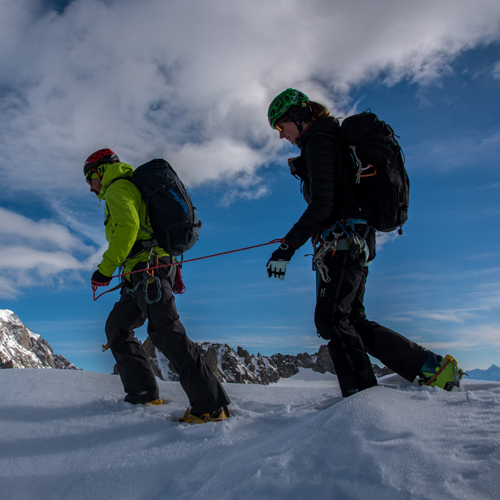 Following the many classic routes of alpinism pioneers, our guides can help you conquer the summit that’s been calling your name. First day: Meeting point at St Jacques or Frachey, Jeep ride up to the Verra plain or to the Bettaforca, hike up to the refuge, stay overnight. 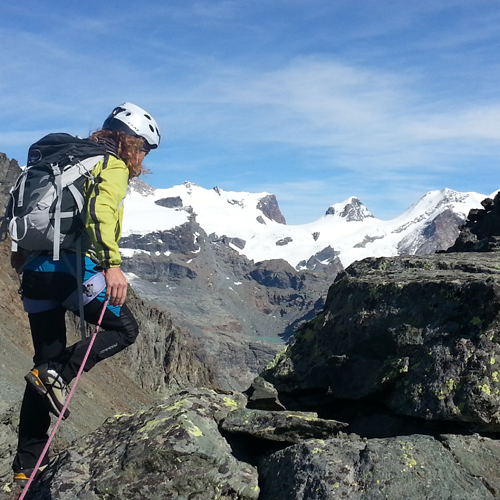 Second day: Departure from the refuge, ascent to the Castor summit and re-entry to town. First day: Meeting point at St Jacques, Jeep ride up to the Verra plain, hike up to the refuge, stay overnight. Second day: Castor Western Face Traverse from the Ayas Guides Refuge to Quintino Sella Refuge, re-entry to town. First day: Meeting point at St Jacques, Jeep ride up to the Verra plain, hike up to the Ayas Guides Refuge, stay overnight. 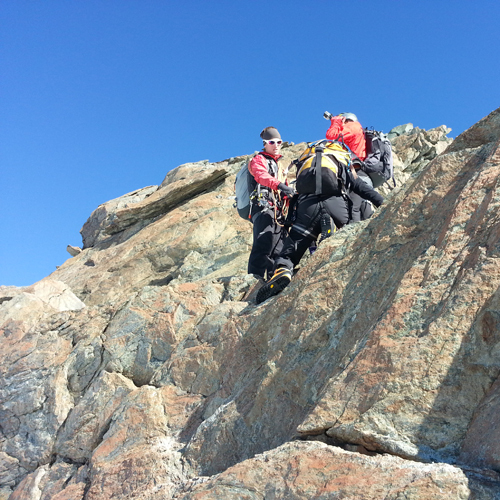 Second day: Castor Southern Face ascent from refuge, re-entry to St Jacques. First day: Meeting point at St Jacques, Jeep ride up to the Verra plain, hike up to the Ayas Guides Refuge, stay overnight. 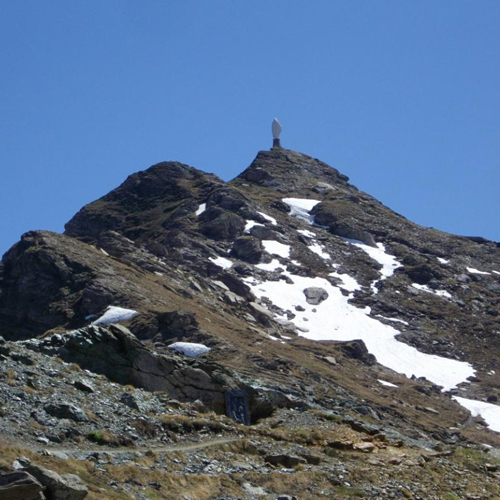 Second day: Departure from the refuge, ascent to the Pollux summit, descent to the Verra Pass, then ascent to Castor summit and re-entry to St Jacques. 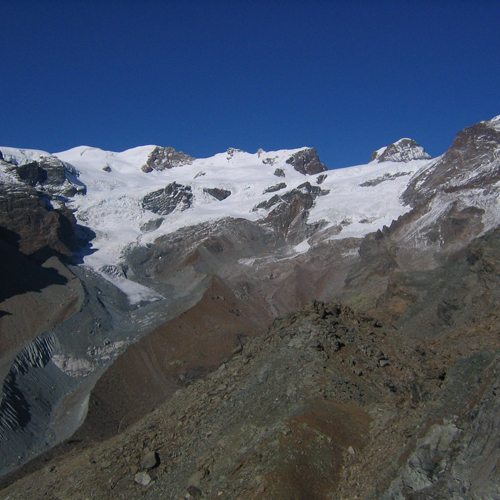 La Roccia Nera with its characteristic snowy slope borders the Porta Nera pass on one side and the beginning of the Breithorn chain on the other. From the top one can see the immense Gornergrat glacier and the 4000m peaks of Switzerland, as well as the entirety of the Monte Rosa. First day: Meeting point at St Jacques, Jeep ride up to the Verra plain, hike up to the refuge, stay overnight. 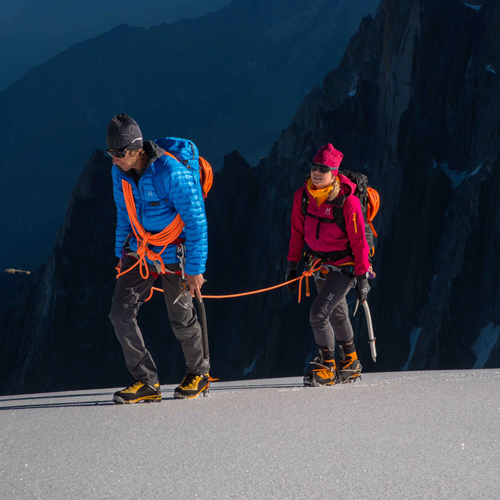 This incredible mountaineering adventure on the Verra Glacier takes place over the course of 2 days, first reaching the Ayas Guides hut and then reaching the peak of the Pollux the next day. The Pollux offers a mixed-terrain ascent, where not only your feet will be doing the work. Its twin the Castor, named for its identical appearance from the Swiss side, is separated by the Verra Pass. First day: Meeting point at St Jacques in the morning, Jeep ride up to the Verra Plain and hike up to the refuge, stay overnight. Second Day: Departure from refuge, ascent to the 4000 meter summit and re-entry to St Jacques. Price includes: Professional Mountain Guide accompaniment and insurance. First day: Ascent to Ayas Guides Refuge, dinner and sleep. Second day: Departure from the Ayas Guides Refuget, ascent of the Western Breithorn peak (4165m) and return to Ayas Guides hut to eat and sleep. Third day: Departure from the refuge, ascent of the Pollux (4091m) and traverse of the Castor (4226m), finishing at the Quintino Sella Refuge to eat and sleep. Fourth day: Departure from the Sella Refuge, ascent of the Lyskamm Nose (4100m), ascent to the Margherita Refuge on the Gnifetti point (4559m), eat and sleep. Fifth day: Departure from the Margherita hut, ascent of the Zumstein (4561m), ascent of the Parrot (4436m), ascent of the Ludwigshohe (4342m), ascent of the Vincent Pyramid (4215m) and return down to Champoluc with the lift system. Price: €915 per person for a group of 2. €550 per person for a group of 4. Difficulty: This experience is made for people in good physical condition with some alpinistic experience hiking on mixed terrain (snow, ice, rock). 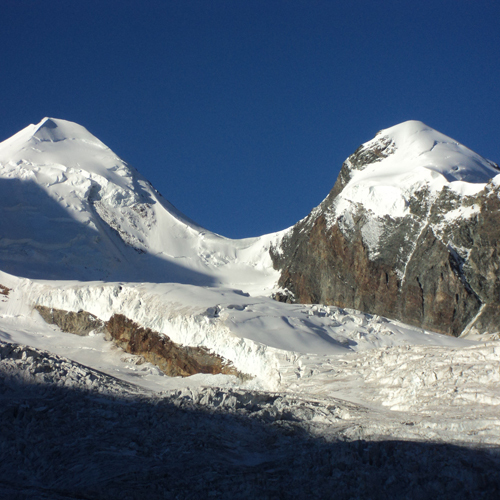 The Breithorn are actually three mountains, called the Occidental, the Central and the Oriental. It is possible to traverse all three, to go from the Central to the Occidental or simply to climb up one of the peaks, all of which reach over 4000 meters. 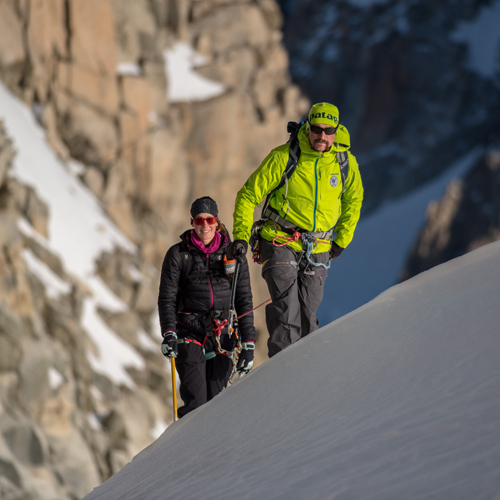 The ascent can be done in one day from Cervinia or over 2 days for a traverse, staying overnight at the Ayas Guides Refuge at the base of the glacier. The price includes: Mountain Guide accompaniment and insurance. The price does not include: Refuge costs of clients and of the guide, the taxi Jeep from St Jacques to the Verra plain (€60 euros for 4 people). First day: Ascent to the Ayas Guides Refuge, dinner and sleep. Second day: Depart from the refuge, Breithorn Traverse from the East peak to the West peak, return to the Ayas Guides Refuge, eat and sleep. Third day: Depart from the refuge, ascent of the Castor, Lyskamm traverse, ascent of Gnifetti Point and the Margherita hut to eat and sleep. Fourth day: Departure from the Margherita Hut, ascent to the Zumstein Point (4561m), Dufour Point (4636m), descent to the Mantova Hut to eat and sleep. The price does not include: The refuge costs of the clients and the guide and the lift tickets. Difficulty: This experience is designed for alpinists in good physical condition and with experience in mountainous terrain. Itinerary: Meeting point at Champoluc Church. Bus ride to Cervinia using the Trek Bus service. Ascent to the Plateau Rosa using the lifts if desired. Dinner and sleeping at the Cervino Guides Refuge. 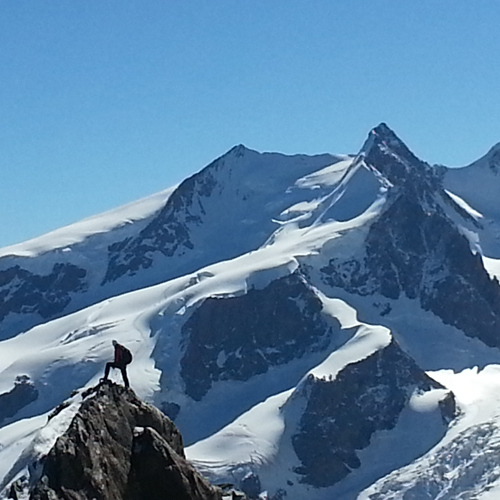 The next day: Ascent and descent of the Breithorn, Glacier traverse and re-entry to Champoluc by foot. 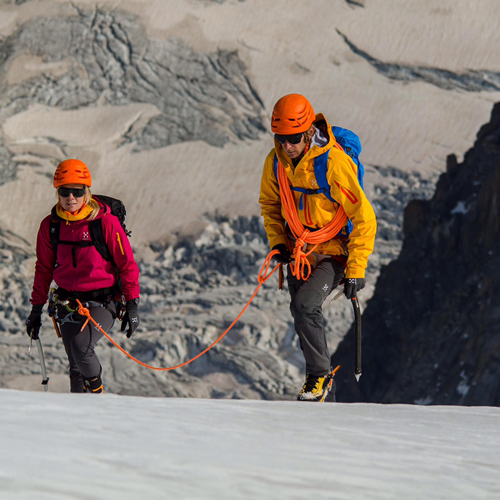 We would like to offer you the unique and exciting experience of being 4000 meters above sea level by climbing the Castor with one of our guides. The hike, especially done for the first time, is incredible. Leaving the town below in the summertime to walk across snow and ice, climbing higher and higher until you reach the summit is something no one forgets. First Day: Meeting point at Frachey, equipment check with the Mountain Guide, ascent to the Quintino Sella Refuge (by Jeep or by chairlifts), dinner and overnight stay. Second day: Departure from the refuge, ascent to the summit and return to Frachey. Special Price: €180 per person, minimum 3 people and maximum 4 people. 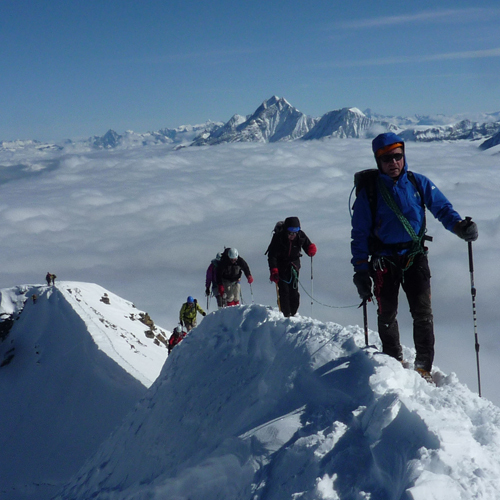 Come with us up to the highest mountain hut in Europe! First day: Meeting point at Gressoney La Tinité at Staffal, equipment check and ascent with the lift system to the Salati Pass. Hike to Rifugio Gnifetti, dinner and sleep. Second day: Departure from the Gnifetti hut, hike up to the Margherita hut. Descent back to Gressoney. The price does not include: The refuge costs of each client and of the guide, the cost of the lifts for the clients and the guide. Departure from Champoluc and ascent to the Tournalin Refuge with a Jeep. Ascent to the summit from the Southeast peak and then descent on the traditional route. Difficulty: Good physical condition is required. Ascent to the Vlou Peak from the Northern ridge. The difficulty level is intermediate as there are some bits of 4th grade climbing. 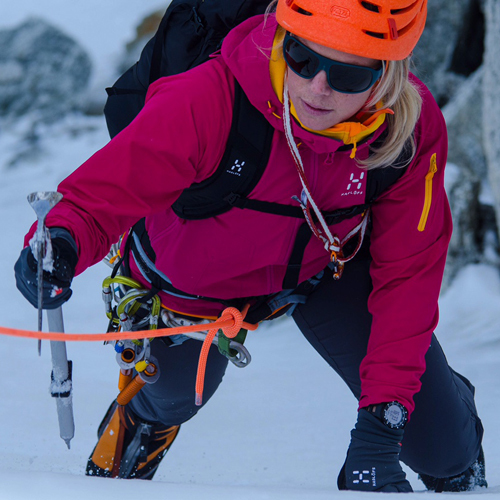 You will be traversing the ridge roped to the guide and there are 1800 meters of vertical ascent. The departure is from Champoluc by vehicle and the hiking begins at Tollegnaz. After the traverse, the re-entry is to Alpe Dondeuil and there is a ride back to Champoluc. The price includes: Professional Mountain Guide accompaniment and insurance. The Dames of Challant are peaks which can be seen from a great distance, even past the border of the Aosta Valley region. They often remain snowy through late spring and early summer, catching the eye of many. We would like you to live the experience of climbing the twin peaks of Torchè and Vlou, an adventure many have thought about but few have done. First day (Saturday, 9am): Jeep taxi to Graines from Champoluc. Easy ascent from Graines in the Frudière valley to Mount Nery, stay overnight in a bivouac. 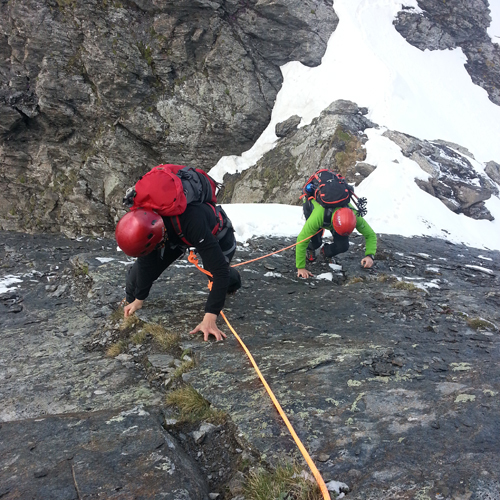 Second day: Depart from the Chasten Pass, ascent to the Voghel Point and traverse the Vlou and the Torchè peaks. Descent to Dondeuil, Jeep taxi back to Champoluc (Sunday afternoon). The price does not include: The cost of the Jeep taxi. Contrary to the name, this ridge is a lot of fun and of a low difficulty level. There are bits of 4th grade climbing and 700 meters of vertical ascent. Starting off in St Jacques, we will be approaching the ridge from the beautiful Nana valley, hiking to the Nana pass which looks out on the Chamoix valley and then beginning the climb. There is also a possibility of taking a Jeep part of the way up as there is a road which leads to the Tournalin mountain hut. 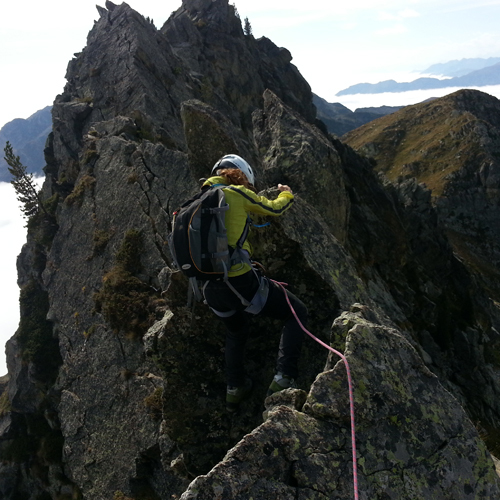 The ridge will be traversed roped to the guide, ending with the descent back to St Jacques. From almost every point in the Ayas valley, you can see the Zerbion mountain standing tall. Its two statues of the Virgin Mary and of Jesus are great hiking goals for a summer. Our guides would like to take you not only to the top, but along the ridge of the Zerbion, passing from East to West. The climb is not very difficult, with some spots of grade 4 climbing and with 850 meters of vertical ascent. The ridge is quite exposed, giving a great view of the lower and high valley. The departure is from Barmasc and the return is at the same spot, completing a loop. The ridge will be done roped to the guide. First day: Meeting point at 9 am, ascent to the Verra plain. Climbing day with knots and safety instructions. Lunch must be packed as we will not be going to the Mezzalama hut until dinner time. Second day: Hike from Mezzalama hut to Ayas Guides Refuge, introduction to alpinistic technique and safety on the glacier. 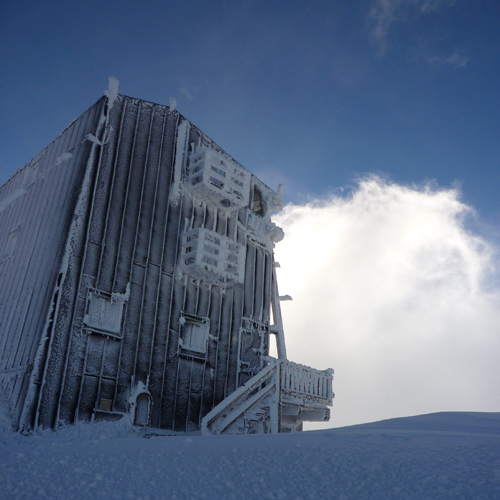 Stay overnight at the Ayas Guides Refuge. Third day: Ascent to the Breithorn summit and descent to the Verra Plain, most likely taking a taxi back down to St Jacques. Price: 300 € a persona, minimo 3 persone. The price does not include: The refuge costs of the clients and of the guide, the cost of the Jeep taxi. Third day: Descent from the refuge and climbing day at the Verra Plain. Re-entry to St Jacques in the late afternoon, possibly by Jeep. Age minimum is 11 years.